Hong Kong- the name automatically conjures the visual of that famous skyline, with high-rise buildings trying to outgrow each other in a dense concrete jungle. But what many of us aren't aware of, is that only a fourth of Hong Kong's area is urbanized, the rest being hilly, forested coutryside! Commissioned by the WWF in Hong Kong, I travelled across the SAR, visiting different country parks to gather references for this project. 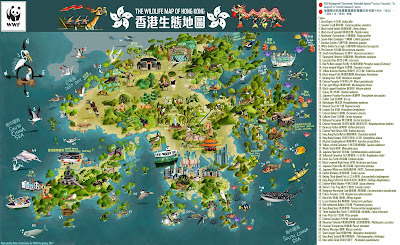 The map shows 63 species of fauna spread across the islands. Hong Kong may not boast of megafauna, but many of the animals found here are special in their own way. The Romer's Tree Frog, HKSAR's smallest amphibian, is endemic to Hong Kong. Following the construction of the Honk Kong International Airport on the island of Chek Lap Kok, the frog's original home range, a captive breeding and reintroduction programme was carried out, and now the frog is breeding in other islands of the SAR. The Mai Po marshes, in the north-west, attract hundreds of migratory species annually, the most notable being the endangered Black-faced Spoonbill. Some other endemics include the Mai Po Bent-winged Firefly, named after the marshes, and the Hong Kong Newt, which is the first wild newt I've seen (in Tai Po Country Park). Towards the west in the Pearl River Delta, Hong Kong's harbours are one of the last strongholds for the Chinese White Dolphin, despite the numerous challenges that the animal faces in these polluted waters. The Finless Porpoise and the Whale Shark also inhabit the South China Sea around the SAR, as does the Green Sea Turtle, which breeds on Lamma Island. Unique not just in its biodiversity but also geology, Hong Kong boasts of some of the most interesting terrain, being situated on volcanic terra firma. Sai Kung Country Park in the east has some of the most gorgeous hexagonal rock formations, while a large part of the coastline is lines with dense mangrove. There are various conservation challenges however to this natural harbour, with massive pressure from urbanization, destruction of mangroves along the coasts, pollution of sea water by cargoes and climate change. 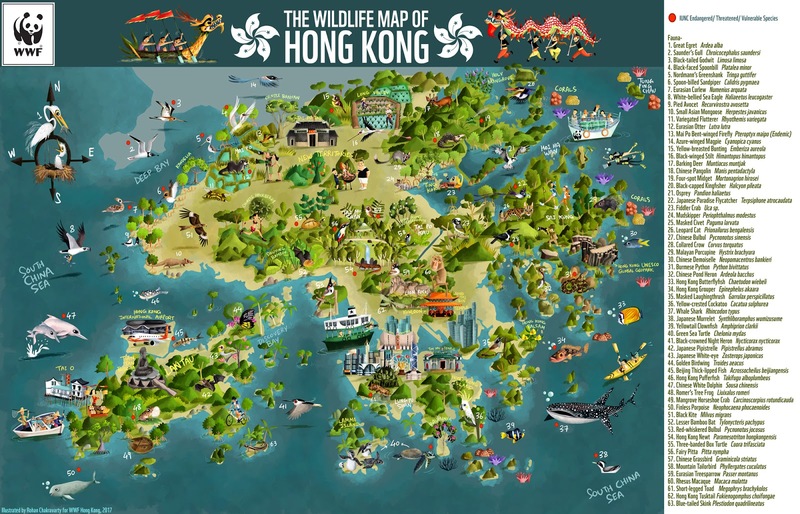 Other than flora and fauna, the map also showcases some of Hong Kong's cultural heritage, such as the fishing village of Tai O, the Tai Fu Tai Mansion, the rice fields of Long Valley, the Star Ferry, and its festivities- the Dragon Boat Race and the Lion Dance. 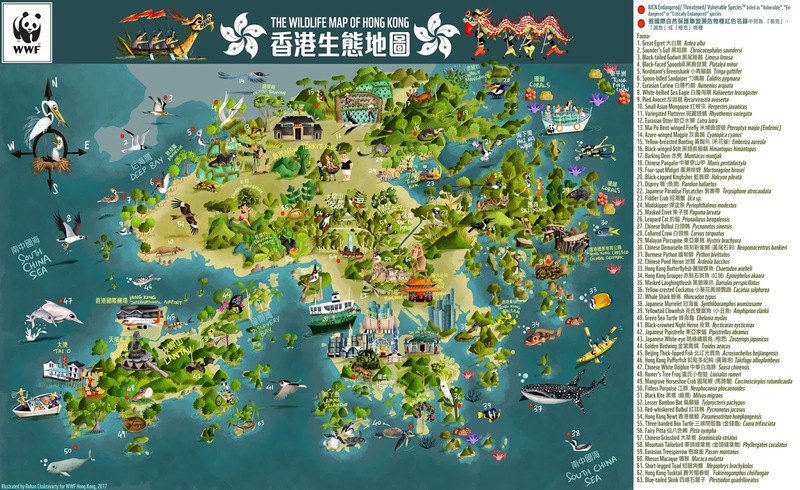 The map was produced with the aim of spreading awareness among Hong Kongers about its biodiversity, and to promote activities such as bird-watching and nature-hiking among the SAR's kids and youth. 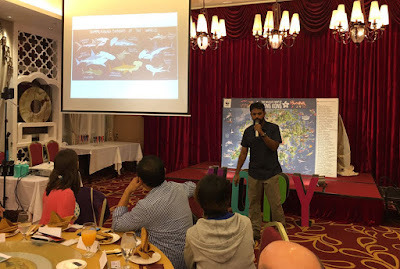 The map was formally launched at the recent One Planet Youth Forum hosted by the WWF in Hong Kong, where I had the opportunity to speak about my work to an audience comprised of young educators and conservationists across the Asia Pacific. 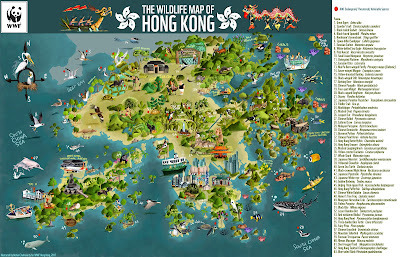 A big thanks to Mr. Alex Wong, Mr. Yamme Leung and Mr. Peter Cornthwaite of WWF HK, for commissioning me for the illustration, and for assigning a wonderful team to show me around Hong Kong! Always impressed by your work. Are there any other take-aways or presentations from the One Planet Youth Forum?